check Office 365 service health Exchange 2007 end of support roadmap The issues you encounter when trying to install Office 365, or Office 2019, 2016 or 2013 and how you fix them depends on whether your product is part of an Office for home or Office for business plan. In addition, with Office for business plans only admins responsible for managing Office 365 in their organization can do certain tasks. Therefore, admins should view the issues and solutions listed under both the Office for business and Office 365 Admin tabs. Not sure what plan you have? Click here to see what products are included in Office for home or Office for business. Tip: If you have Office Professional Plus through your company's subscription to the Home Use Program, see Office through the Home Use Program (HUP). If your Office product is one of the follow, you have an Office for home product. This can be an Office 365 subscription, or a one-time purchase of Office or individual Office application. These products are usually associated with a personal Microsoft account. Office 365 subscriptions: The following products include the fully installed Office applications. Office 2019, Office 2016, or Office 2013 versions available as one-time purchases: The following products include the fully installed Office applications. Tip: *The desktop version of OneNote is only available 2016 and 2013 versions. Beginning with the release of Office 2019, OneNote for Windows 10 is the default OneNote experience for Office 365 and Office 2019 customers. See the FAQ. If your Office product is one of the following, you have an Office for business product. These products are usually associated with a work or school account, and your Office license (if your subscription has one) came from the organization where you work or go to school. Tip: With these Office 365 subscriptions, there are no desktop applications to download and install, but in most cases you can still access and use online versions of Office apps in your web browser. Learn more Free Office Online apps. How do I download and install Office? How do I reinstall Office? Can I install Office on a Chromebook? Can I install only certain apps? Can I install Office on a different drive? I'm a student. How do I get Office? How do I install Office updates? If you're looking for the steps to download and install the latest version of Office such as Office 365, Office 2019, or Office 2016, see Install Office on your PC or Mac. If you want to download and install Office 2013 or Office for Mac 2011, see Install Office 2013 on a PC or Install Office for Mac 2011. For Office 365 subscriptions: We recommend you first deactivate the install you don't need anymore and then uninstall it from that PC or Mac. See Deactivate an Office 365 install. Remember, with Office 365 Home, you can install Office on up to 5 PCs or Macs; with Office 365 Personal you can only install Office on 1 PC or 1 Mac; and with Office 365 University you can install on 2 PCs or Macs. Installing Office on more computers than what your plan allows will result in activation and unlicensed product errors. For a one-time purchase of Office 2016 such as Office Home & Business, Office Home & Student, or Office Professional: You can install Office on only 1 PC or Mac. However, you may transfer Office 2016 (or Office 2013) to another computer that belongs to you if you experience a hardware failure or you buy a new computer. For more information, see the Microsoft License Terms for your product, or see this blog post, Office now transferable. For the latest version of Office, see Install Office on your PC or Mac. For Office 2013 or Office for Mac 2011, see Reinstall Office 2013 on a PC or Reinstall Office for Mac 2011. If you encountered a problem while installing Office on a PC, try restarting your computer and then attempting to install Office again. If that didn't help, use this easy fix tool to uninstall Office completely. After your uninstall is complete, try reinstalling Office. If Office still won't install, check that your computer meets the system requirements to install Office. For example, you can't install Office on computers running Windows XP or Windows Vista. If you're still unable to install Office following the steps in Download and install or reinstall Office try using the offline installer. If your computer can't install the full desktop version of Office because your computer doesn't meet the system requirements, you can try using Office Online in your computer's browser. See the supported browser section on the system requirements page. You can't install the desktop PC or Mac versions of Office on your Chromebook, but depending on your Chromebook you may be able to install the Office mobile apps. See Install Microsoft Office on a Chromebook. When you install Office 2016 or Office 2013, all the applications that came with your particular Office product is installed at the same time. You can’t custom select which Office applications you want to install or not install, nor you can't delete individual applications after your installation is complete. However, you can delete shortcuts to applications you don’t plan to use. Tip: If you discover you need an application that didn't come with your Office product, you have the option to purchase a stand-alone application. For example, you may decide you need Access or Outlook, but those applications weren't included in your product. To purchase a stand-alone application, go to https://products.office.com/ and do a search for the app you want to buy. You can only install Office on the system drive where your operating system is installed. That’s usually your C: drive. You may get an error if you try to install the 64-bit version of Office and you currently have the 32-bit version installed (or vice versa). Therefore, if you previously installed the 32-bit version of Office on your PC, but decide you now want the 64-bit version, or vice versa, you'll have to uninstall the bit version you don't want and then reinstall the bit version you do want instead. Use this easy fix to uninstall Office. Select your browser from the drop-down list to see how to save and then launch the file. 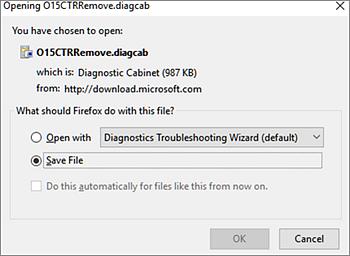 In the next box that indicates o15-ctrremove.diagcab is finished downloading, click Open. The Uninstall Office wizard launches. Select Next and follow the prompts. When you see the Uninstallation successful screen, follow the prompt to restart your computer for the changes to take effect. If you're looking for the steps to install the 64-bit version of Office, see the section, Step 1: Sign in to download Office. For Office 2013, see Install Office 2013 on a PC. If you're not sure how to decide between 64-bit or 32-bit, see Choose the 64-bit or 32-bit version of Office 2016. If your organization subscribes to the Home Use Program (HUP) find information about how to buy and install Office at, Install or reinstall Office through Microsoft HUP. I'm a student. How do I install Office? If you're a student or teacher, and you don't see an option to install Office through your institution, you may be eligible for Office 365 Education, which includes Word, Excel, PowerPoint, and OneNote. All you need to get started is a valid school email address. For more information, see Get Office 365 for free. See Known issues with Office and Windows 10. You're on a PC and you're trying to install the Mac version of a one-time purchase of Office, such as Office Home & Student; or you're trying to install the PC version of Office on a Mac. For solutions to this, see Unsupported operating system error when installing Office. You're trying to install Office on a mobile device, such as an iPad or iPhone, or a Chromebook. The Install button available after signing in at office.com downloads the version of Office designed to run on a PC or Mac. To install Office on a mobile device see Set up Office apps and email on a mobile device. You're trying to install the desktop version of Office on an unsupported operating system such as Windows XP or Vista. Check the system requirements for Office to see what operating systems are supported. If Office is taking a long time to install you may be on a slow connection. See Office is taking long to install or Office hangs at 90% for possible solutions. If you're trying to install Office on a computer running Windows XP or Windows Vista, you may get an error that says the dynamic library KERNEL 32.dll can't be located. This occurs because newer versions of Office aren't supported on these versions of Windows. For more information, see Why can’t I install Office 365, or Office 2019, 2016, or on Windows XP or Windows Vista? Check that your computer meets the minimum system requirements to install Office. See System requirements for Office for a list of additional requirements. If you're not sure which operating system you have, see Which Windows operating system am I running? or Find the OS X version and build number on your Mac. If your computer can't install the full desktop version of Office because it doesn't meet the system requirements, you can try using Office Online in your computer's browser. If the Install button is grayed out, your Office 365 subscription might have expired. See Renew Office 365 for home. For other solutions, see Install button doesn't install Office. This error can occur if you haven't updated Office 2013 to the latest version or you have a standalone 2013 app which is already included in the newer Office 2016 suite of apps. See Error: Stop, you should wait to install Office 2016. We’ll have to remove the following if you continue for steps on how to resolve. You might get an error that has a number and maybe some descriptive text. Although the messages are hard to understand, there are often solutions. Try these links if you get these errors. Not every error is listed here. If there's a Learn More link on the error message, select that. If there's no link, let us know what error you got and where you were in the install process when you received it. Leave us a comment at the bottom of this page to let us know more about your issue. How do I get the newest features in Office 365? Keeping Office up-to-date ensures that you have the latest security updates and fixes. For information about installing updates, see Install Office updates. Microsoft has more than one kind of Office 365 service and each service has its own sign-in page. Where you sign in from your web browser depends on which service you're using. See Sign in to Office or Office 365. In most cases, if you have an Office product listed under Office for home you need a Microsoft account to sign in to install Office or manage your Office 365 subscription. If you don't remember what Microsoft account you associated Office with, see I can't remember the Microsoft account I use with Office. See How to share your Office 365 Home subscription with up to four people. If you want to cancel your subscription, see Cancel or turn off recurring billing for a Microsoft subscription. If you have an Office 365 plan, to keep it active, you have to sign in at least once every 30 days. If your subscription hasn't expired, Office will reactivate the subscription the next time you log in. You can activate Office on up to five computers. If you've used up your five installs and want to install Office on another computer, you have to deactivate an installation. Deactivation doesn't remove Office from the computer, but you can't use Office on that computer until you activate it. See Deactivate an Office 365 install. If you're looking for where to install Office on a Mac, see Install Office on your PC or Mac. For download and installation issues on a Mac, see What to try if you can't install Office 2016 for Mac. When you install Office 2016 for Mac, the app icons aren't automatically added to the dock. To add to the dock, drag the app icon from the Launchpad or the Applications folder. See Add the Office for Mac app icon to the dock. Select the version of Office you want to uninstall. To troubleshoot Mac activation issues, see the "Activation" tab on What to try if you can't install or activate Office for Mac. To check what the latest update is, see Update history for Office for Mac. For help with troubleshooting email setup on your phone or tablet, see Troubleshoot email setup on mobile. In most cases you can do basic editing on most of these devices, however if you have a qualifying Office 365 subscription, you get access to the apps' extra features. If you discover you can't make edits to certain documents, see What you can do in the Office apps on an Android, iOS, or Windows mobile device with an Office 365 subscription. If you can't find the Office applications after installing Office, or you're not sure your install worked, see Can't find Office applications in Windows 10, Windows 8, or Windows 7? You might see an "<application> stopped working" error when you try to start one of these Office applications: Excel, Word, Outlook, PowerPoint, Publisher, or Visio. Older versions of add-ins might cause this type of problem. To resolve, first make sure you installed the latest Office update. If the application still isn't working, try the options in, Why do I get a "stopped working" message when I start my Office application? See What version of Office am I using? For steps to install or reinstall Office 2010, see Install Office 2010. For Office 2007, see Install Office 2007. If you're still having trouble installing Office, see Contact Office Support. We value your feedback. Please let us know if you found any of these solutions helpful by leaving us a comment below. If it didn't, tell us more about your issue, including any error messages your received and where you were in the install process when you received it. We'll use that information to help investigate your issue further. To help with issues you might encounter when installing Office, download the Support and Recovery Assistant for Office 365 tool. "Stop, you should wait to install Office 2016"
Where do I install Office for Mac? How do I download and install or reinstall Office? If you're looking for the steps to download and install the latest version of Office, see Install Office on your PC or Mac. After February 28, 2017 you won't be able to install Office 2013 as part of your subscription. See Office 2013 will no longer be available for installation with an Office 365 subscription for more details including what the Office 365 admin in your organization can do if you must reinstall Office 2013. I have a subscription for Project or Visio. How do I download and install them? Project and Visio aren't currently supported on a Mac. To install Project Online Professional or Project Online Premium on your PC, see the section Download and install Project. To install Visio Pro for Office 365 on your PC, see Download and install Visio Pro for Office 365. After February 28, 2017 you won't be able to install Project 2013 or Visio 2013 as part of your subscription. See Office 2013 will no longer be available for installation with an Office 365 subscription for more details including what the Office 365 admin in your organization can do if you must reinstall the 2013 versions of Project or Visio. When you install Office 365, all the applications that came with your particular Office product is installed at the same time. You can’t custom select which Office applications you want to install or not install, nor you can't delete individual applications after your installation is complete. However, you can delete shortcuts to applications you don’t plan to use. Tip: If you discover you need an application that didn't come with your Office product, you have the option to purchase a stand-alone application. For example, you may decide you need Access or Outlook, but those applications weren't included in your product. To purchase a stand-alone application, go to https://products.office.com/ and do a search for the stand-alone app you want to buy. If you previously installed the 32-bit version of Office on your PC, but decide you now want the 64-bit version, you'll have to uninstall 32-bit and then reinstall the 64-bit version of Office. To uninstall the 32-bit version use this easy fix to uninstall Office. If you can't find Access on your computer even though its included with your Office 365 subscription, try the following in the order listed. Note: Access can only be installed on computers running Windows 7 or later. You can't install Access on a Mac. Open an Office application, such as Word or Excel and create a new document. From the ribbon, select File > Account. Under the Product Information section, select Update Options > Update Now. When the update is complete, click Start and look for Access in your list of apps. Follow the steps in Install Office on your PC or Mac. If you need to install the 64-bit version, select the PC step-by-step tab and expand the section, "Install or reinstall an Office for business product." If you're not already signed in, go to http://portal.office.com and sign in with your work or school account. Note: If you're unable to sign in with your work or school account, you may be signing in to the wrong Office 365 service, see Where to sign in to Office 365. 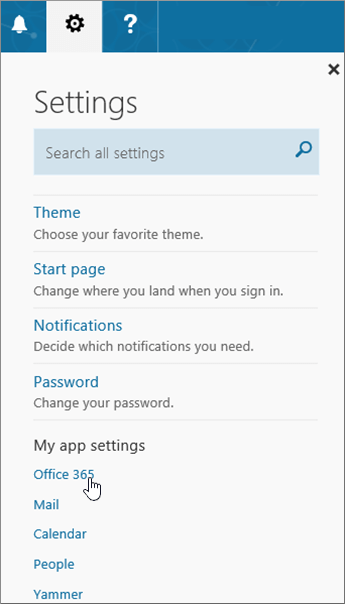 From the browser header, go to Settings > My app settings > Office 365. On the My account page, select Subscriptions. You’ll see the services that you're licensed to use, such as the latest desktop version of Office, SharePoint Online or OneDrive for Business, and Exchange Online. If you don't see The latest desktop version of Office in the list (or Project or Visio if your organization has a plan that includes those applications) your admin probably hasn't assigned an Office license to you. If you're an admin, see Assign licenses to users in Office 365 for business. For more information, see What Office 365 business product or license do I have? If you have a license, then you're ready to Install Office on your PC or Mac, (or Project Online Desktop Client or Visio Pro for Office 365). 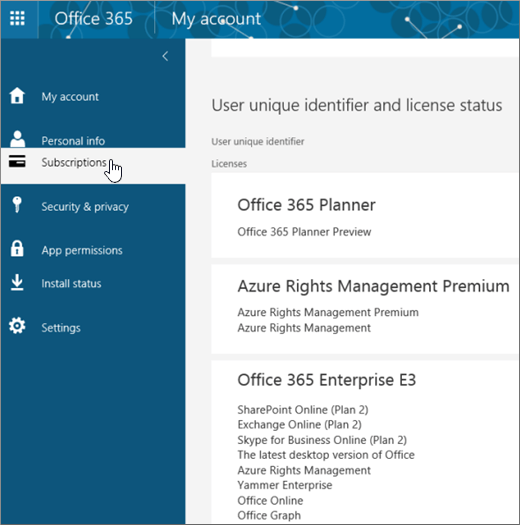 Not all Office 365 subscription plans come with the fully installed Office applications. See the bottom of the Office for business column for a list of plans that don't include the Office desktop client. If your organization has one of these Office 365 plans, the Office 365 admin can switch to a different Office 365 plan or subscription or buy another Office 365 for business subscription for users in an organization who require the full version of Office. If you're an admin and you aren't sure what plan you have, follow the steps in What Office 365 for business subscription do I have? For a comparison of plans, see compare small business plans or compare enterprise plans. If you're a student or teacher and don't see an option to install Office, you may be eligible for Office 365 Education, which includes Word, Excel, PowerPoint, and OneNote. All you need to get started is a valid school email address. For more information, see Get Office 365 for free. Be sure to check the System requirements for Office. For example, you can't install Office on computers running Windows Vista or Windows XP, or on devices that aren't running a supported Windows or Mac operating system. However, you may still be able to use Office Online in your computer's browser. If Office is taking a long time to install you may be on a slow connection or you another install or update may be happening in the background. See Office is taking long to install or Office hangs at 90% for possible solutions. If the Install button is grayed out, your Office 365 subscription might have expired. Select your subscription from the list in Renew Office 365 for business to see the steps for how to renew it. If you're trying to install Office on a computer running Windows XP or Windows Vista, you may get an error that says the dynamic library KERNEL 32.dll can't be located. This occurs because newer versions of Office aren't supported on these versions of Windows. For more information, see Why can’t I install Office 2013 or Office 2016 on Windows XP or Windows Vista? If you're on an Office 365 subscription, you will see an upgrade notification in the menu bar of your Office applications or you can update your version manually by signing in to Office 365. See Upgrade to Office 2016 using Office 365 for business. Office up-to-date ensures that you have the latest security updates and fixes. If your admin has given you permission to install updates, see Install Office updates. Microsoft has more than one kind of Office 365 service and each service has its own sign-in page. Where you sign in depends on which service you're using. Sign in with your work or school account at https://www.office.com/signin. This is the account that you created or someone in your organization created on your behalf. For more information about accounts, see Where to sign in to Office 365 or What is my user ID and why do I need it for Office 365 for business? If you've forgotten the password for the work or school account you use with Office 365, you can reset it at, https://passwordreset.microsoftonline.com/ or contact your organization's administrator. As an Office 365 for business user, you can download Support and Recovery Assistant for Office 365 to help you fix activation issues. If that tool doesn’t resolve your issue or you recently switched plans and now get an unlicensed product error or can't use your Office applications, see Unlicensed Product and activation errors in Office. If activation failures began after you upgraded to Windows 10, see Office error code 0x8004FC12 when activating Office. You can activate Office on up to five computers. If you've used up your five installs and want to install Office on another computer, you have to deactivate an installation. Deactivation doesn't remove Office from the computer, but you can't use Office on that computer until you activate it. If you're an Office 365 user, do the following to deactivate an installation. Go to https://portal.office.com/Account/#home. If prompted, sign in with your work or school account. From the Install status tile, select Manage installs. Under Install status, select Deactivate to deactivate the Office installations you no longer use. For more information, see Deactivate Office 365 if you see a "limit reached" error. If you're looking for steps describing how to install Office on a Mac, see Install Office on your PC or Mac. Office recognizes what operating system you're using so make sure you're on your Mac when you click Install to begin the install procedure. When you install Office for Mac, the app icons aren't automatically added to the dock. To add to the dock, drag the app icon from the Launchpad or the Applications folder. See Add the Office for Mac app icon to the dock. See Uninstall Office for Mac for instructions on uninstalling the Office apps. To troubleshoot Mac activation issues, see the "Activation" section in What to try if you can't install or activate Office 2016 for Mac. If your admin has given you permission to install updates, the Microsoft AutoUpdate makes sure your copy of Office will always be up-to-date with the latest security fixes and improvements. To install or check for updates on your Mac, see Check for Office for Mac updates automatically. To check what the latest update is, see Update history for Office 2016 for Mac. See Can't find Office applications in Windows 10, Windows 8, or Windows 7? When you install Office it's automatically linked to your Office 365 plan. This means if you or the users in your organization see Account Notice or Unlicensed product errors in Office, they need to install the version of Office that comes with the new Office 365 plan, and then uninstall the version that came with the previous plan. Use this easy fix tool to uninstall Office and then follow the steps to reinstall Office. You might see an "<application> stopped working" error when you try to start Office applications: Excel, Word, Outlook, PowerPoint, Publisher, or Visio. Older versions of add-ins might cause this type of problem. If you use Office 365 operated by 21Vianet in China, sign in with your work or school username and password at https://login.partner.microsoftonline.cn. If you use Office 365 Germany, sign in with your work or school username and password at https://portal.office.de. There you’ll see the services that you're licensed to use, such as the latest desktop version of Office, SharePoint Online or OneDrive for Business, and Exchange Online. If you don't see The latest desktop version of Office in the list, your admin probably hasn't assigned an Office license to you. If you're an admin, see Assign licenses to users in Office 365 for business. For more information, see What Office 365 business product or license do I have? If you're still having trouble installing Office, contact your Office 365 admin. If your admin can't find a solution for you after using the information on the Office 365 admin tab, he or she can contact support on your behalf. You can also try the Community forums. To help with issues you may encounter when installing Office, download the Support and Recovery Assistant for Office 365 tool. Admins should also see the Office for business tab for more general Office installation issues. When you first sign up for Office 365 for business and you try to install Office (or Project or Visio if you also have a subscription for those apps) you might see a message that says you can't install Office because you don't have a license. This could happen because of a delay between your initial sign in and Office 365 for business setting up your environment. Try signing out of Office 365 and then signing back in. It could also happen because you haven't assigned a license to yourself or your users. Do the following to check your licenses. You’ll see the services that you're licensed to use, such as the latest desktop version of Office, Project, Visio, SharePoint Online or OneDrive for Business, and Exchange Online. If you don't see The latest desktop version of Office in the list (or Project or Visio if you bought plans with those applications), see Assign licenses to users in Office 365 for business. Not all Office 365 subscription plans come with the fully installed Office applications. See the bottom of the Office for business column for a list of those plans that don't include an installed version of Office. If your organization has one of these Office 365 plans, as the admin, you can switch to a different Office 365 plan or subscription, or in addition to the subscription you already have, buy another Office 365 for business subscription for those users who require the full version of Office. If you're not sure what plan you have, follow the steps in What Office 365 for business subscription do I have? For a comparison of plans, see Office for business. If you or the users in your organization see Account Notice or Unlicensed product errors in Office, they need to install the version of Office that comes with the new Office 365 plan, and then uninstall the version that came with the previous plan. Learn how in “Account Notice” appears in Office after switching Office 365 plans. If you or your users find Office is taking a very long time to install, try installing using an offline installation. See Use the Office 2016 offline installer and select the Office for business tab. These steps show you how to download the installer file which you can then use to install Office offline on a PC at your convenience. How do I install the latest version of Office on more than five computers? You can activate Office on up to five computers per user. If a user needs to install Office on a sixth computer, you have to deactivate an installation. Deactivation doesn't remove Office from the computer, but you can't use Office on that computer until you activate it. See Deactivate Office 365 if you see a "limit reached" error. How do I get the rest of my organization set up with Office 365 for business? To help you set up your organization, see Set up Office 365 for business – Admin Help. If individuals in your organization are using an older version of Office, we recommend you upgrade to the latest version. See Upgrade users to the latest Office client. How do I deploy Office to multiple computers in my organization? If you’re an IT Pro and you want to deploy Office in your organization, use the Office Deployment Tool to download the Office software to your local network. You then deploy Office by using the software deployment method you typically use. You can also choose to have users sign into the Office 365 portal with their work or school account and follow the steps in Install Office on your PC or Mac to install Office themselves. How do I manage licenses for people in my organization? Users need licenses to install Office and to use Outlook, SharePoint Online, Lync Online, and other services. As the Office 365 for business admin, you're responsible for Managing user software in Office 365. You assign licenses to new users when creating new accounts, or add licenses to existing users, see Assign licenses to users in Office 365 for business. To remove licenses from users, see Remove licenses from users in Office 365 for business. If you need more licenses, see Buy licenses for your Office 365 for business subscription. To remove a license from your subscription, see Remove licenses from your Office 365 for business subscription. There are two types of activation methods for volume editions of Microsoft Office: Multiple Activation Key (MAK) and Key Management Service (KMS). For help activating these editions, see Activate volume editions of Office. As an Office 365 admin, you can check Office 365 service health. This article is for Office installation issues. The links below are specific to admins looking for troubleshooting help with these Office 365 services. For more general (not admin specific) help in these areas, see the Additional help section on the Office for Business tab of this topic. If you're still having issues, admins can Contact Office 365 for business support. We value your feedback. Please let us know if you found any of these solutions helpful by clicking Yes or No next to Was this information helpful, below, and leaving us a comment. If you are still having problems, tell us more about your issue, including any error messages your received and where you were in the install process when you received them.